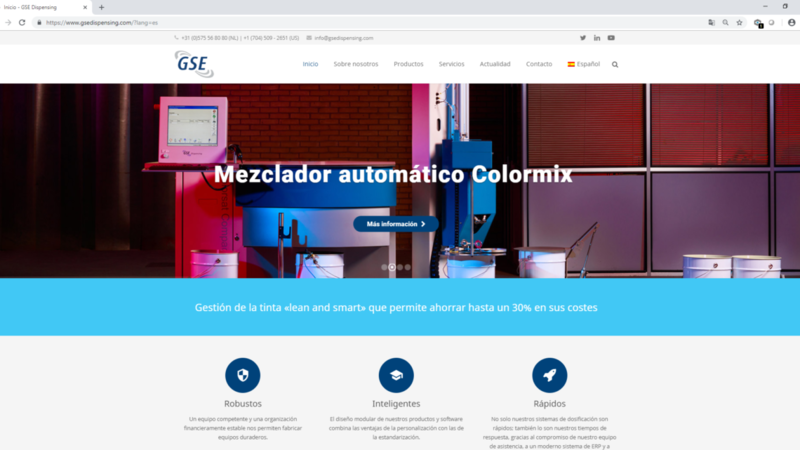 In an acknowledgement of the rapidly growing number of customers in Spanish-speaking regions, GSE, supplier of ink logistics solutions for the packaging, label, and textile markets, has launched a Spanish version of its website. In addition to information about the company’s programme of dispensers, services and software, the website provides a variety of resources to help printers operate ‘lean’ and ‘smart’ workflows and eliminate waste from internal processes. “The website provides a vital resource tackling every element of waste in the system and by making good-practice guides accessible to a wider audience with additional language support, we can help more customers benefit from our research and experience,” said Maarten Hummelen, marketing director, GSE. “Guides are available on recipe preparation, reusing inks returned from the press, proofing, tracing ingredients through the supply chain, stock control and reordering, among many others. GSE’s modular dispensing systems provide fast, accurate mixing and dispensing of flexo, gravure and screen inks and pastes. GSE Ink manager software, launched in 2018, enables converters to minimise ink-related waste, providing improved ink yields, enhanced reporting and business planning and reduced setup times. In January, GSE was confirmed as one of six national regional contenders for the Metaalunie Smart Manufacturing Award 2019 in the Netherlands, after being declared the winner for Gelre. The annual award is organised by Koninklijke Metaalunie, a confederation representing over 14,000 small and medium metalworking firms across the Netherlands. It recognises organisations that distinguish themselves with modern production techniques and processes, choice of materials, well-thought-out systems, digitalisation and a self-managing and self-learning organisational culture.